For families who don’t share the same taste buds, the Skyline Inn has made dinner easy by offering restaurant options that will please the whole family. Located close to your hotel suite, these restaurant options will leave you satisfied without having to go far. If breakfast is your favourite meal, enjoy it all day at Perkins. With a delicious bakery and family friendly meals this restaurant will make the whole family happy! Buffets are perfect for your family if you can’t agree on one option. Enjoy the beautiful view of Niagara Falls while indulging in delicious meals that will please any craving. Take an exotic adventure on your next trip to Niagara Falls by visiting the Rainforest Cafe. Surrounded by exotic sights and sounds, a meal at this cafe will not disappoint! The Hard Rock surrounds you with memorabilia from your favourite rock bands and artists and features awesome Tex-Mex themed cuisine. The music enthusiasts will be fascinated by all the collectibles and artifacts that surround you while you eat. 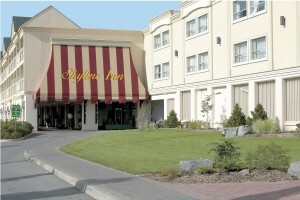 Choose a restaurant with a scenic view of the Falls or a restaurant that surrounds you with your favourite memorabilia. Here at Skyline Inn we have tons of options available for you and your family!